This Sunday we went to Stephanie's house to see the latest litter of lab puppies, and were they ever cute! Her dog Missy just had a litter of six, four boys and two girls, five black and one chocolate. 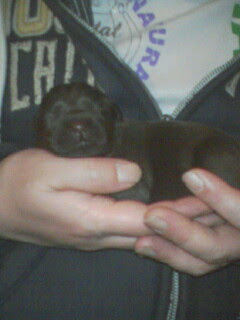 They were only born a few days ago, so their eyes and ears were still closed tightly but they were sooooo sweet. Another one of her dogs, Tim-Tam is due later this week too, so they'll be swimming in puppies! The picture above is Sho-chan holding the one chocolate baby girl. Just saw this picture of Hakuho and his 7 month old son Mahato on Yahoo Japan and had to post it. Look at his little baby yokozuna-belt. How cute is that?